It's the day after Valentine's Day. Even though I've been in Iten for one and a half months, I'm still learning the Kenyan way. "Hakuna Matata" isn't just a phrase from the Lion King. It's a way of being (I've only actually met one Kenyan who says this regularly, but it makes me smile every time he does). But some days, its tough to live a worry free life. This was one of those days. Despite the fact that we planned ahead with the school to distribute cups on Thursday at 4:00pm, despite the fact that we coordinated this three weeks ago, despite the fact that we were just teaching there yesterday and the deputy principal and the headteacher agreed to this time and the students repeated it back to me...I received a call around eleven asking us to reschedule for next week because they wanted to have mass that day instead. Apparently, some of the school's sponsors had arrived unannounced that morning. Meanwhile Golda, my partner in crime from the Golden Girls Foundation, was 20 mins out from Iten, bringing with her 200 Ruby Cups from the distant lake town of Kisumu. She been on the road for over 4 hours. 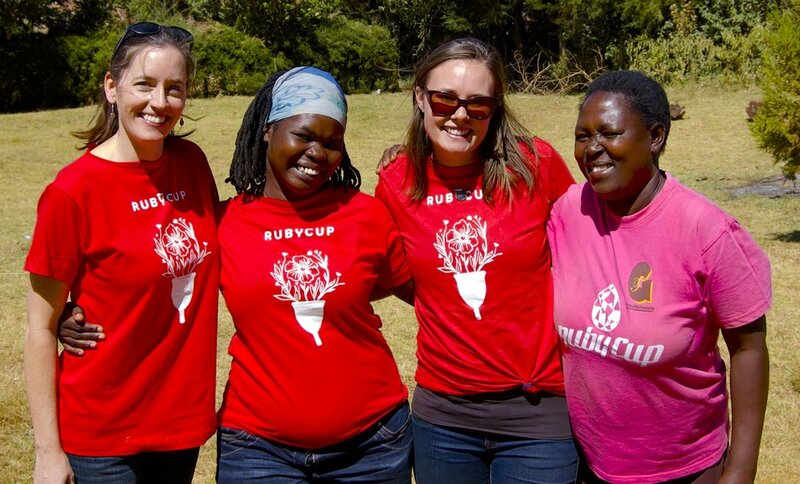 Mind you, Golda is a busy woman, coordinating a foundation, finishing her PhD at school, and constantly training mentors and girls on how to use Ruby Cups in her spare time. There was no way I was going to send her home and hope that she could come back on Monday. I explained the situation to the teacher on the phone, how our partners just traveled four hours by matatu to get here, and that we couldn't reschedule for next week. She then asked if I could just drop the cups off for the girls and come back next week to teach them how to use them. That wasn't an option. 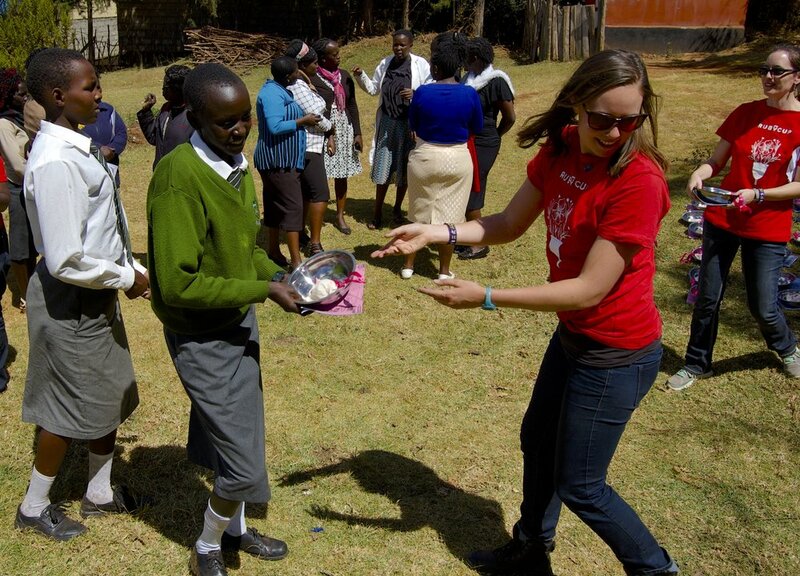 Distribution Day is more than handing cups to girls, shaking their hands, and saying good luck. It requires ice breaking, trust building, anatomical education, and careful instruction on how to insert the cup and to keep it clean. Taking a deep breath, and a sip of Kenyan Chai Masala, I told myself to remain calm and that everything would work out just fine. Because it would, right? I let myself be frustrated for two minutes (O.K. Teresa, I know you're rolling your eyes, I was mad for five minutes, I admit it). And then, I let it go. I called the teacher back. I asked her if we could come teach during lunch so the girls could make it to mass at four, and she agreed with this idea. Once our plan was finalized, I called our driver and asked him to be there in fifteen minutes while Teresa ran to find Trevor, Canada's up-and-coming marathon superstar, who bravely volunteered to be our cameraman for the day (chocolate bribery may or may not have been involved in his recruitment). I've had the pleasure of working with Golda and Miriam on two previous distributions, once at Kamariny Primary and then again at Shoe4Africa Martin Lel Secondary. Today was Teresa's first time meeting them, and she was eager to see how the day would shake out. We made it to the school, and then we were immediately ushered into the principal's office. He apologized for the change in time, and welcomed us to instruct the girls during the lunch hour (as long as we were careful not to cut into classes more than 10 mins). I made eye contact with Golda, as my brain was rapidly trying to figure out how to instruct 200 girls in a field and distribute Rift Kits in 30 minutes. Ever flowing with confidence and ease, she smiled and played along with the principal. I told my inner control freak to be quiet, and just go with it. After all, when in Kenya, do as the Kenyans do. From left to right: Teresa, Golda, Alyssa, and Miriam. A dream team, if I ever saw one. 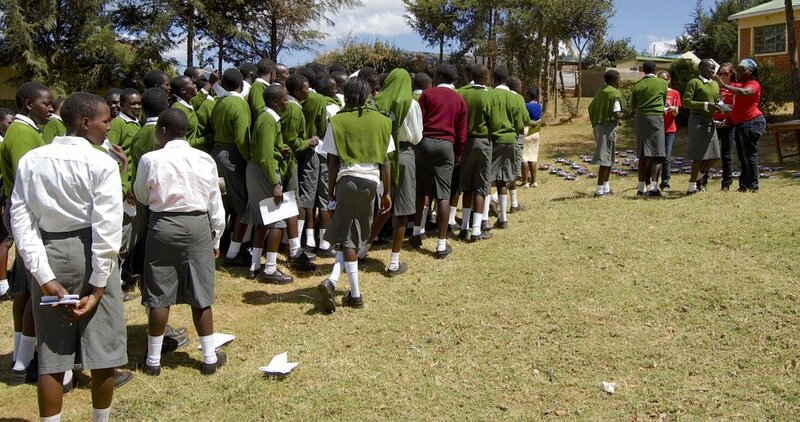 The girls of St. Peter's Iten Secondary School started congregating in the field. It was half past one, and classes would resume at two. The head madam tells me to make sure the instruction doesn't cut too much time into their school schedule. I smile and nod as I pass out Ruby Cup surveys and tell the girls to grab pens if they didn't bring one to the field, wondering how exactly we were going to pull this distribution off. Golda takes center stage (er...field) and that's when the magic happens. She captures the girls attention with a call and response, and all eyes are on us. Teresa and I stay for introductions, and then we gladly hand the reins over. When Golda talks, people listen. She's captivating, confident, and has a way of making people learn through laughter. I nod to Teresa, and we head to prepare the kits in effort to save time. I turn back to listen as Golda bounces back and forth between Swahili and English, and my worries fade away. At last, we are at the school. The girls are gathered and giggling. The teachers are listening. Before long, these girls (if they so choose) are going to receive the gift of a lifetime: a menstrual cup that can give them worry-free periods for up to ten years. Trevor making Rift Kits in front of an audience of very curious Kenyan teachers. As we set up the Rift Kits, which include a Ruby Cup, a notebook for the workshops, and a bowl to keep the cup clean, the teachers stand back and watch. I see them pointing, whispering, and giggling. Sensing their curiosity, I hand them a cup, and they open the cloth bag with excitement. At first, I think they are shocked by the size. They pass it around, each taking a turn squeezing the silicone "thing" thats supposed to "go down there". As if on cue, Teresa and I begin instructing the teachers on how to use it. 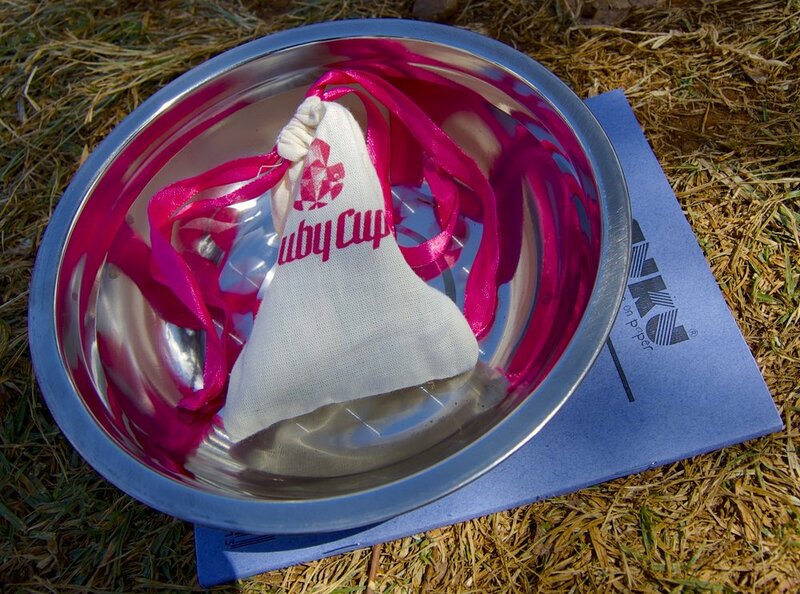 We offer several different folds to try and tell them three basic rules of care: 1) change the Ruby Cup with clean hands 2) rinse it with clean drinking water while you're on your period 3) boil it between menses. The questions explode from there, ranging from how cup use affects virginity to how long they can keep it in. Teresa and I instruct the teachers on how to use the Ruby Cup while Golda engages the students behind us. Unfortunately for us, it was a windy day. Each gust of wind that came along meant we were chasing notebooks, bowls, and Ruby Cups around the field. At long last, we had the situation under control and the wind died down for a a passing moment. We returned to the group, just in time to catch Golda finishing her presentation. The Rift Kits are ready! Where my girls at? I checked my watch. It was 2:24. I looked around, and the teachers were captivated. The girls were asking questions about the cups. No one seemed to notice that we had passed our allotted time. More importantly, no one seemed to care. When I am arranging the workshops and the distributions, I am very careful to operate with the utmost respect of the school system here. Kenyans take their education seriously, especially in this time of year so close to their national exams, and I am careful not to interfere with class time. At all of my schools, I teach during lunch or at the end of the day. However, it was clear the teachers saw the importance of what we were doing today. They saw the girls learning about their bodies, they saw them talking about a taboo subject with strangers, and they saw them having a good time. The stress of my morning coordinating the distribution faded to a distant memory, and ultimately proved inconsequential. Those smiles, as you can see below, makes it all worth it. If you haven't figured it out by now, it's not about the cup, it's about the ripple effect of the cup. Think about it this way. If one girl uses the cup, then maybe that makes it easier for another girl to be willing to try it, too. Take away the financial stress of how to pay for pads each month, or the emotional stress of whether or not the old blankets scraps will adequately contain the monthly flow from flowing out onto your your skirt, and suddenly you can concentrate. You can go to school without fear. Before you know it, you're not missing school once a week every month (which can quickly add up to three months per year). The more you're in school, the more you learn. The more you learn, the healthier and better off your families and communities will be. Maybe these girls will try and like the cup, or maybe they won't. 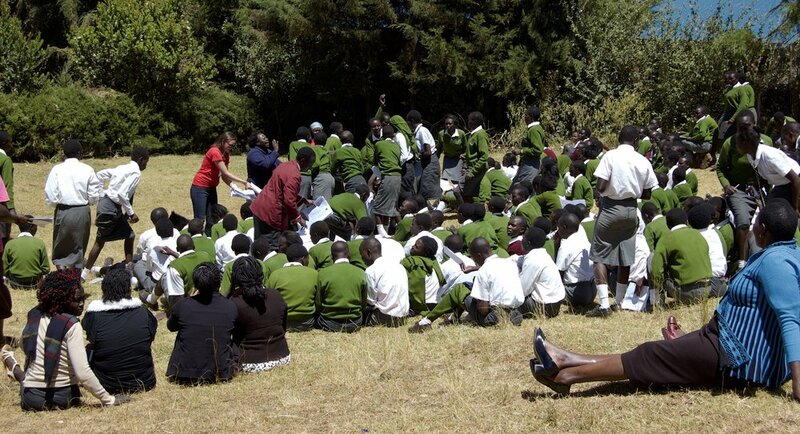 At least at the end of the day, they learned a little bit more about female reproductive health and can better understand the menstrual cycle. How could you not love that reaction to a Ruby Cup? At the end of every presentation, Golda invites the girls to try the cup, free of charge. She explains that Ruby Cup is just another tool in their menses toolkit, and it is their choice. She heads up to meet us, and every student gets in line to receive their Rift Kit. At the end of the day, everything worked out. Despite the change of plans, despite the time crunch, despite my own fears. The teachers that were so worried about missing class happily stayed through the instruction, distribution, and then walked away giddy with their own Ruby Cups to try. In our distributions, we think it's just as important to train and give the teachers cups. When we are gone, they'll be the ones the students turn to if they have questions. Plus, it increases acceptance of the product and normalizes menstrual cups for the whole community. to all of our donors, partners, and faithful blog readers. You made this day possible. 183 Rift Kits and counting!